Athletes thermoregulate in hot or cold conditions in two ways, by making either physiological or behavioral changes. My previous blog post about racing cyclocross in the cold dealt a lot with the physiological processes and concepts that assisted thermoregulation. This blog will deal mostly with the behavioral things racers can do to help them thermoregulate. In nature, animals (and humans) use behaviors such as moving in or out of sunlight or the wind, or increasing their activity to help with thermoregulation. Cross racers don’t have much ability to move themselves into better thermoregulating positions unless the course directs them there. Cross racers are also already exercising at max or pacing their work output specifically to win so increasing activity is not really an option either. This leaves cross racers with only a few behaviors that they have control over in order help them regulate their temperature during their races. An athlete’s warm-up and how they dress being two of the most important. Before we even consider what temperature cyclocross is raced at, the nature of the sport makes a good warm-up imperative. Cyclocross is a relatively short endurance event that begins with an all out effort. These two factors alone necessitate that athletes allow for enough time to warm-up and pay close attention to how they do it. Throw in the environmental factor of cold temperatures and the importance of the warm-up increases. Warm-ups before endurance events allow for multiple beneficial physiological processes to occur. The warm-up increases cardiac output and dilates capillary beds in working muscles. It also increases the temperature of the muscle, which in turn increases the rate of the enzymatic reactions occurring in the muscle. This increase in the rate of enzymatic reactions will continue to occur until the temperature reaches a point where it begins to denature (cook) the enzymes of the reaction, decreasing their ability to catalyze. Increasing the body’s temperature also warms connective tissues such as ligaments and tendons, helping to reduce the possibility of injury. This is especially important in cyclocross where athletes do dynamic movements like dismounting, remounting, and running barriers. Also, besides getting the body physically ready to perform the exercise at hand, the warm-up should also be a time for the athlete to mentally prepare for the event. 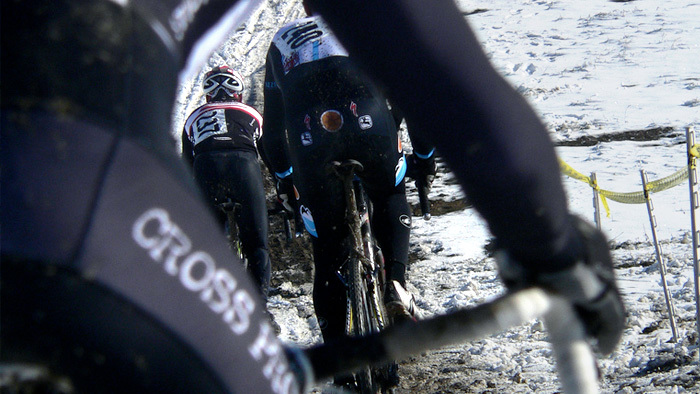 Warm-ups for cyclocross races differ from warm-ups for other cycling races and warm-ups for cyclocross races in the cold differ from cyclocross races in warmer conditions. When warming up for a cold cyclocross race, warming up indoors or in some kind of shelter on a trainer while wearing warm clothing is ideal. This reduces the rate of convection and increases the rate of warming while reducing the time needed to warm-up. This reduction in warm-up time helps to spare glycogen stores and reduces chances of fatiguing before racing. The warm-up should be done in increments from low intensity to high intensity. It takes ~10 minutes for a muscle to reach thermal steady state at a given output of work. This means a warm-up should be at least 10 minutes in length, but a 20-30 minute warm-up on the trainer is not unheard of, and is often encouraged- as long as the intensities are not fatiguing the athlete. A good guideline for when to end a warm-up is when the athlete is sweating. This signifies the body is beginning to thermoregulate itself because the upper level of its thermal tolerance is being reached. A little bit of sweat is good, but be careful not to sweat too much. Too much sweat can steal body heat and reduce core temperature when the warm-up exercise has ceased. As mentioned before, the mental aspect of the warm-up is also important. This can be divided into pre-competition visualization and “last minute practice”. For the cross racer, visualization includes positive imaging of riding the course and how the start should go. A great time to do this is while riding the trainer. “Last minute practice” includes pre-riding the course and “sessioning” obstacles. It is very important to allow time for this in the warm-up. Also, be sure to dress warmer while pre-riding than what you would when you race, since you most likely won’t be pre-riding the course at the intensity you would during a race. My general rule is if it’s “cold” and your race number is visible (meaning it’s pinned on your outer layer of clothing) during your warm-up you are most likely either underdressed for your warm-up or overdressed for your race. Allow for at least 5 to 10 minutes of rest between the warm-up and the competitive event. In cyclocross this is not difficult to do because of how long it takes to line-up races and start them. The major concern, especially in cold temperatures, is cooling down too much prior to the race. It is in the best interest of the racer to wear their warm-up clothes to the line and remove them as the time approaches for them start. Ideally, a friend or family member can grab your warm-up clothing from you just before the start of the race. What clothes a racer should wear during a cross race deals a lot with the factors that were covered in the basics of thermoregulation blog (anthropometric measurements, physiological responses, environmental conditions, etc). Due to variances in individuals, each person will most likely have to find what kind of clothing works for them for each weather condition. This isn’t good news for someone who doesn’t race in the cold often… or ever (but on the bright side, at least you don’t really have to worry about acclimating to the climate in order to perform well). For people who do have a chance to race and ride in the cold it’s not a bad idea to record what you wear and the weather conditions you competed in into your training logs so you have a reference of what works and doesn’t work for you. By now it should be understood that, in terms of thermoregulation and racing bikes in the cold, it’s all about maintaining a body temperature for optimal performance (not to high & not too low), while at the same time protecting extremities. In cold conditions it is completely possible to have your core temperature at an optimal level for performance, but still be at risk of extremities getting frostbitten. These parts include: ears, fingers, toes, noses, man parts, and in extreme cases chins and cheekbones; but the order of importance for protecting these parts from the cold often depends on the individual. It is also a good idea to cover your knees and protect them from the cold, even though it isn’t necessarily considered an “extremity” by most people. This is because of a multitude of factors: it is an uber-important joint for cycling, it has little fat insulating it, it has little vascular tissue surrounding it, connective tissues in joints move better when they are warm, and it is exposed to wind and air movement from the forward motion of the bike which causes it to cool quickly. A felt lined knee warmer, tight, or knicker is the way to go for knee protection… not embrocation, as will be discussed in the next blog in this series. Other clothing tips involve surface to volume ratios. The head and arms have a lot of surface for the amount of volume they have and also have a lot of circulation running through them. They are great places to lose heat and should be the first places to be covered when trying to conserve heat (i.e. the warm-up). Due to the fact that wearing a helmet when racing cyclocross is compulsory, changing headgear during competition becomes pretty much impossible. This leaves the arms as the best part on the body to cover or uncover for thermoregulation purposes while racing. Which is why, in my opinion, arm warmers are one of racers’ best friends. If you find yourself too hot during a race arm warmers can be quickly peeled down to allow for cooling and avoidance of a potential decrease in performance. A non-thermoregulating “do” when racing cyclocross in the cold is to be aware of cold induced branchospasms. If you have a history of allergies or asthma you may be more susceptible to this. If you are, a trip to your doctor or a specialist may be in order. There are drugs that can alleviate these constrictions, but beware of the use of these drugs and doping restrictions. It is the responsibility of the racer to know what they put in their body and if that substance is illegal.